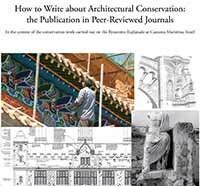 In this study, I am researching the publication of journal articles about Architectural Conservation in peer-reviewed journals. My objective is to review three conservation journals - the Journal of Conservation & Museum Studies; Conservation and Management of Archaeological Sites; and the Journal of Architectural Conservation in order to document their publishing requirements, and to discuss these observations in the context of a potential publication about the architectural conservation work carried out on the “Byzantine Esplanade” at the archaeological site of Caesarea Maritima, Israel. I am using published and unpublished professional and scholarly literature, as well as archaeological and intervention data.